Since 1963 "The Letterbox Man" has been a name synonymous with excellent customer service, innovative design, letterboxes of the highest quality and being the specialist in the mailbox field. We have an extensive range of mailboxes both for the residential and multi-dwelling market. Our exclusive aluminium extrusions make for stronger, safer and more durable letterboxes. We pride ourselves on our ability to custom make letterboxes (in Australia) to your individual requirements. We manufacture mailboxes from aluminium, 316 Marine grade stainless steel and mild steel. 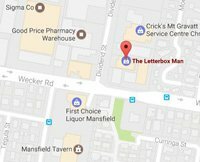 If you can't find the mailbox that you want from The Letterbox Man, you may not find it anywhere else. Don't settle for the rest, buy only the 'Original and the Best'.